FAME Studios founder Rick Hall produced iconic records for Aretha Franklin, Wilson Pickett, Etta James, and more. Now he gets behind the microphone to tell his own story. The Man From Muscle Shoals: My Journey from Shame to Fame chronicles Hall’s life, starting with his poor upbringing in Franklin County, Alabama and leading to the legendary FAME Studios in Muscle Shoals, Alabama. There, Hall produced chart-topping hits from soul music to pop to country music. In 1971, Hall was named Billboard’s Producer of the Year for the World and, in 2014, received a Grammy Trustees Award for his significant contribution to the recording industry. The 2013 documentary film, Muscle Shoals, profiles Hall’s life and his career. The audiobook, published by ListenUp Audiobooks, features Hall reading the first chapter, which was recorded at FAME Studios. The rest of the audiobook is narrated by Jeremy Arthur, who has leant his voice to nearly 100 audiobooks including Whiskey Bottles and Brand-New Cars: The Fast Life and Sudden Death of Lynyrd Skynyrd, by Mark Ribowsky, and Pickett’s Charge, by Charles McNair. The Man From Muscle Shoals: My Journey From Shame to Fame will be available from ListenUpAudiobooks.com on September 22, 2015. ListenUp Audiobooks is an Emmy award-winning spoken word audio production company and audiobook publisher offering a full range of audio production services. ListenUp Audiobooks has been producing audiobooks for publishers, including Hachette Audio, Penguin/Random House, Harper Audio, and Audible for 15 years. The company works with narrators from Atlanta, New York, Los Angeles, and nationwide. ListenUp Audiobooks is a proud member of the Audio Publishers Association. Dozens of ListenUp Audiobooks titles now available for the first time for lending through the OverDrive platform. OverDrive provides 24/7 access to digital titles. ATLANTA, April 17, 2015 — ListenUp Audiobooks, an audiobook publisher, producer, and distributor located in Atlanta, today announced that more than a dozen audiobook titles are now available to public libraries, schools, and institutions of higher education worldwide through OverDrive’s leading book lending platform. ListenUp’s catalog is a premier collection of audiobooks containing a wide variety of genres with titles that are contemporary, engaging, and diverse and appeal to a broad audience of audiobook listeners. Through OverDrive, libraries will be able to offer 24/7 access to ListenUp Audiobooks’ digital titles. Notable titles now available include Searching for Grace Kelly, by Michael Callahan, Trident’s First Gleaming, by Stephen Templin, The Decline and Fall of IBM, by Robert X. Cringely, Pickett’s Charge, by Charles McNair, and Just a Couple of Days, by Tony Vigorito. ListenUp Audiobooks joins 5,000 other publishers in the largest catalog of eBooks, audiobooks, music, and video for lending through the OverDrive network. True crime novels by beloved true crime author, Jerry Bledsoe, are available in audio for the first time. Jerry Bledsoe made a name for himself with a series of true crime novels based on murders in his home state, North Carolina. Now, for the first time, many of those novels are being released as audiobooks. 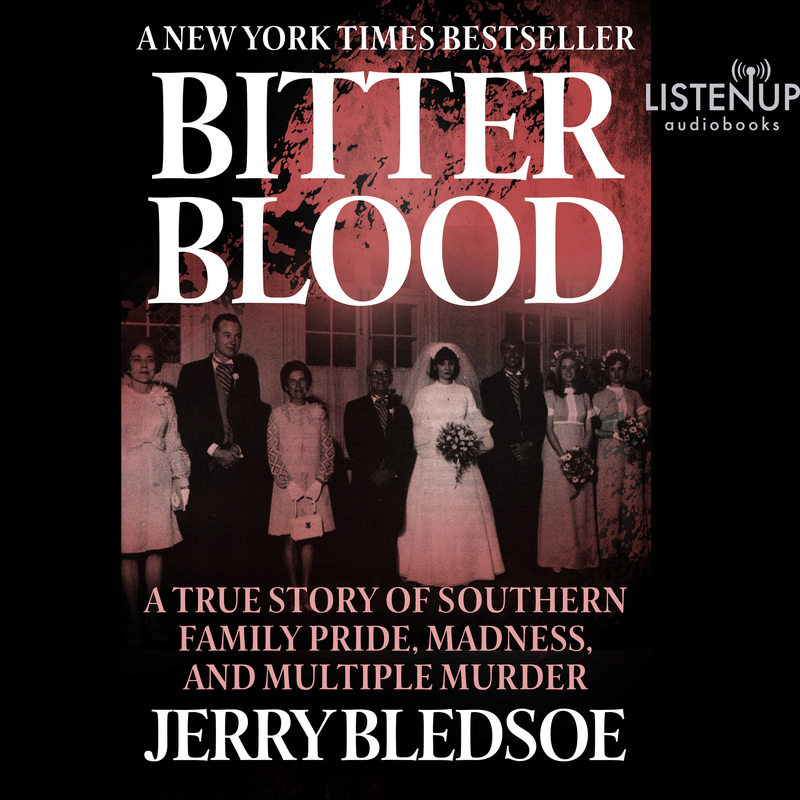 The news was announced April 1 by audiobook publisher, ListenUp Audiobooks, which is now selling Bledsoe’s Bitter Blood: A True Story of Southern Family Pride, Madness, and Multiple Murder, for download on its website. Bitter Blood reached #1 on the New York Times bestseller list when it was first published in print in 1988. Bitter Blood tells the shocking true story of obsession and bitter custody battles that eventually resulted in nine deaths in the mid-1980s. Bledsoe, a beloved syndicated columnist, wrote for publications across the Southeast. Bledsoe is a familiar name to a generation of Southerners who grew up anticipating his next column, where he chronicled horrific events occurring in sleepy North Carolina towns. Three other Bledsoe novels will be coming soon from ListenUp Audiobooks. Fans can pre-order Blood Games, Before He Wakes, and Death Sentence from ListenUpAudiobooks.com. All four audiobooks will also be available from Audible.com, iTunes, and most libraries. Voice actor Kevin Stillwell narrates the audiobooks. ATLANTA – February 12, 2015 — ListenUp Audiobooks, an Emmy-award winning audiobook production company, has launched a division dedicated to publishing audiobooks, as well as developing original audio work. The new publishing division of ListenUp Audiobooks has already produced dozens of titles, including “Trident’s First Gleaming”, written by Stephen Templin, “Searching for Grace Kelly”, written by Michael Callahan, “Kinda Like Brothers”, written by Coe Booth, and Pickett’s Charge, written by Pulitzer Prize nominee Charles McNair. “We have had a great experience with the titles we have already completed and anticipate publishing hundreds more in 2015,” said Fogg. ListenUp Audiobooks also offers downloads of thousands of audiobooks from the industry’s largest publishers through its website, with new titles being added every day. ListenUp Audiobooks also expects to publish enhanced audiobooks and original works. The first ListenUp Original, “Funny Story: The Incomplete Works of Topher Payne”, is a collection of short stories by acclaimed Atlanta playwright, Topher Payne. It is available only from ListenUpAudiobooks.com and was created specifically to be heard, rather than read. ListenUp Audiobooks has been producing audiobooks for publishers, including Hachette Audio, Penguin/Random House, Harper Audio, and Audible for 15 years. The company works with narrators from Atlanta, New York, Los Angeles, and all over. Since 2012, ListenUp Audiobooks has been located in East Atlanta Village. One of Atlanta’s most prolific and acclaimed playwrights, Topher Payne, is leaping into new territory with his newest work, Funny Story: The Incomplete Works of Topher Payne, an audio collection of selected humor essays from Payne’s GA Voice column, Domestically Disturbed, his short fiction, and scenes from his plays. The tales are at times touching, at times hilariously irreverent, and at times bemusingly inappropriate. 2014 has been a huge year for Payne, including the Atlanta premiere of his play, Perfect Arrangement, with Process Theatre in Decatur. Chicago’s Steppenwolf Theatre announced it will be presenting a production of his play Angry Fags. 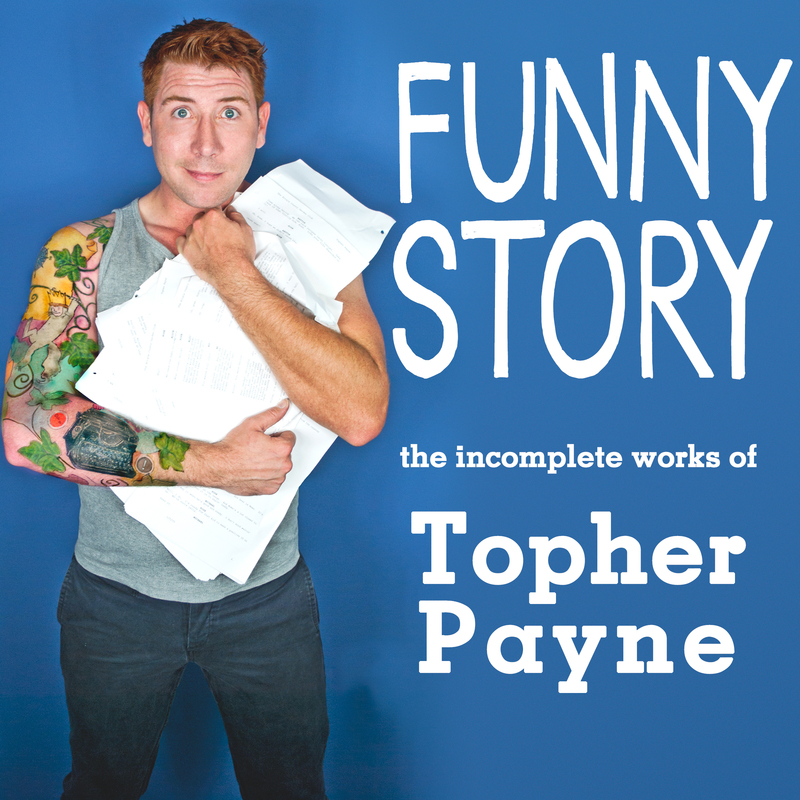 He’s been seen on stage and this week sees the publication of his first audiobook, Funny Story: The Incomplete Works of Topher Payne. The audio includes performances by the author and a cast of professional Atlanta actors, including Amanda Cucher, Johnny Drago, Jo Howarth, Kristin Kalbli, Shelly McCook, Nicholas Tecosky, and Jacob York. Funny Story was created specifically to be heard, not read. From its conception, its goal is to create a different listening experience than that of a traditional written work simply recorded into audiobook format. Funny Story includes some scenes from Payne’s plays, including one from his award-winning dark comedy, Angry Fags, which premiered in 2013 on Atlanta’s 7 Stages. It also includes stand-alone short stories such as “The Groom’s Cake”, a pathologically passive-aggressive narrative from a southern mother-of-the-groom, and “Ghost Baby”, which outlines the pitfalls of keeping someone’s memory alive a little too long. Funny Story is available September 15 from ListenUp Audiobooks, studio and audiobook publisher located in East Atlanta. ListenUp Audiobooks is an Emmy-award winning production company providing professional grade spoken word audio for the audiobook industry. ListenUp provides sourcing of narrator talent, directing, engineering, producing, editing, and mastering from their state-of-the-art digital studios in Atlanta. Expanded services include author rights sharing and marketing for both audio and e format book publishing. Visit http://www.listenupaudiobooks.com – a destination for book lovers of all ages to download favorite titles for audiobook listening pleasure. ListenUp Audiobooks is an affiliate partner of Amazon’s Audible.com and a proud member of the Audio Publishers Association.